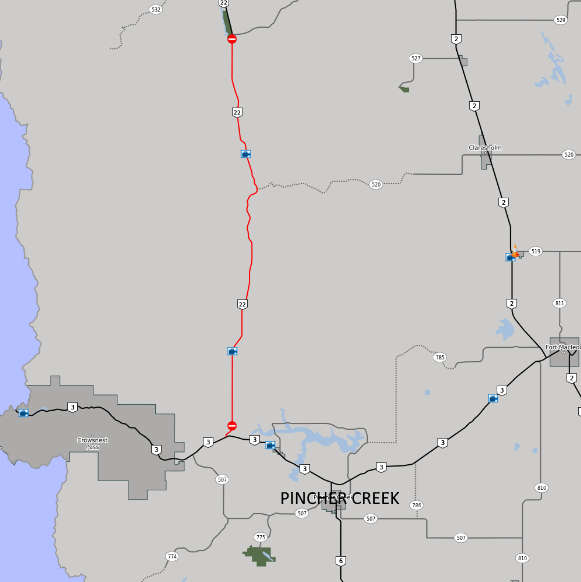 511.alberta.ca - Highway 22 from Highway 533 to Highway 3 (south of Chain Lakes and northwest of Lundbreck) is closed due to a wildfire in the area. Expect reduced visibility due to smoke. Drive with caution. Alberta Emergency Alert update issued Wednesday October 25, 4:56 pm - There is a mandatory evacuation order for residents on all of Chimney Rock Road and south to Highway 520 on the west side of Highway 22. This is an evacuation alert for residents north of Chimney Rock Road to Highway 533 on the west side of Highway 22. Residents evacuating please call the Municipal District of Ranchland No. 66 office at 403-646-3131.